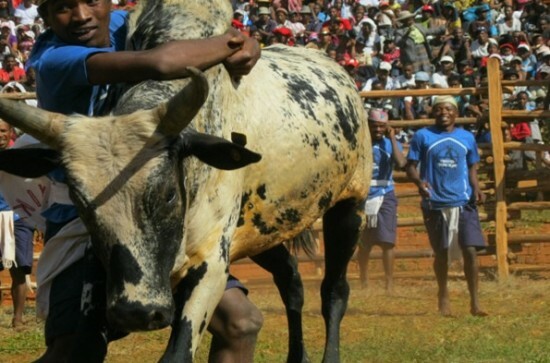 Savika is a rodeo-like sport practiced by men of the Betsileo ethnic group in Madagascar. It’s considered a rite of passage, and any man who dares dance with the angry zebus is considered a hero of the community. No one remembers exactly when savika was invented, but everyone agrees it has been practiced by Betsileo men for centuries. The traditional sport is enjoyed by all members of the community, be they men or women, young or old, rich or poor, and is considered a unifying factor that brings everyone together. Savika is also a rite of passage for young boys who want to prove their manhood, and one of the best forms of courtship for single men. Apparently nothing impresses Betsileo women more than seeing their men dance with a zebu – a kind of domesticated cattle with long horns and a distinctive hump. A savika event begins with the zebu being teased into frustration, before the players (called mpisavika) start sneaking up behind it trying to grab its hump and hang on to it for as long as possible without getting trampled or stabbed in the process. It’s a dangerous sport and injuries do occur, but savika has been around forever and the Betsileo love it so much it has even become a celebration at weddings and baptisms. The brave mpisavika who dance with the bulls don’t receive any trophies for their courage, and they don’t need any – the respect of the community and the status of hero are more than enough. While savika is sometimes compared to controversial traditions like Spanish bullfighting, members of the Betsileo community say their sport has nothing in common with Western ones in which animals are tortured. “Savika expresses the desire of love between the human and the zebu. Their contact regarded as a fight has the same meaning as the linkage between two individuals who become of the same mind with each other,” a savika trainer told African Review, and even the name of the sport suggests that – the verb “misavika” means “to hold”. In Madagascar culture, zebu is considered the most prized possession a man can have, even more important than owning a house or a nice car, and savika is just another way of expressing the bond between man and zebu.